You’re normally on your pegs around 9.30 am, having met for a briefing and to draw pegs earlier that morning. A typical day produces a mixed bag of around 300 birds, shooting pheasants, partridges and duck. Elevenses are served in the field between drives, and lunch is taken back at Keeper’s Cottage midway through the day, though it is also possible to shoot through and lunch later in the day. With Shannon airport just 30 minutes away, John can make arrangements for those flying in and out on the same day. John Forde’s life in fieldsports began when he became involved in gundog fieldtrials, something that saw him take his dogs picking up on the private shoots across Ireland. From there he became involved in the burgeoning syndicate shooting industry. He began to build Mulberry Shoot about five years ago and it has gone from strength to strength. He’s tremendously proud of his work, coaxing a shoot out of nothing in the wilds of western Ireland. He’s a living embodiment of the term ‘Irish Hospitality, and Margaret and John love hosting teams of guns from around the world, taking pride in offering a warm welcome and showing their guests a memorable day of challenging driven shooting. Selection of dates available for the coming season. Please Make a Booking Enqiry if you want a different date. Please contact us to discuss availability . Please enquire about availability if the dates you want are not listed above. John has a great knowledge of local hotels and can recommend accommodation to suit all budgets near to the shoot and airport. County Clare is packed with historic towns to visit, as well as picturesque coastal villages. For landscape lovers there’s the remarkable Burren and Cliffs of Moher Geopark, a UNESCO site, which consists of some incredible geology, archaeology and natural history. There’s also the Wild Atlantic Way to explore, and a host of adventure sports to try. Robert Ford describes his first visit to our Mulberry Shoot. 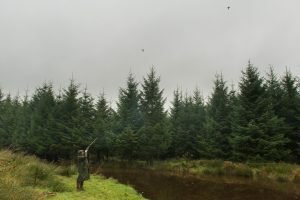 Read The Mulberry Experience in Irish Shooter’s Digest.